I was very impressed with Symposium's Ultra Platform and Svelte Shelf, both of which I reviewed last month. Both lowered the noise level of my electronics and allowed cleaner music to flow from my speakers. Along with the Svelte Shelf and Ultra Platform, Symposiums Peter Bizlewicz kindly included a trio of each of his Rollerblock Series 2+ and Rollerblock Jr. ver. 1.1 footers. Given the sonic improvements (as opposed to simple changes) Id achieved via the Ultra Platform and Svelte Shelf, I wanted to give Symposium's Rollerblocks an opportunity to demonstrate whether they could accomplish the same results. Rollerblocks, whether the Series 2+ or the Jr. ver. 1.1s, are ball-in-cup designs created to, as Symposium puts it, "couple and decouple" your equipment from the surface theyre sitting on. They do this by floating the equipment on bearings while still being mechanically coupled to what they support. Symposium feels that the mechanical coupling to the footer improves the opportunity for vibration to be transferred out of the equipment and into the footer -- away from anywhere it can gum up the musical works. The Rollerblock Series 2+ is a small, black anodized rectangular metal block with a special vibration-absorbing material inserted into a honeycomb matrix embedded into the bottom. Each block is made of aircraft-grade 7075 aluminum alloy. The top of the block has a highly polished spherical depression that looks separate but is, in fact, a contiguous part of the block. In it sits an ultra-hard precision tungsten-carbide bearing. Each base is laser etched with Symposium's logo on one side. A trio costs $399 USD. The Rollerblock Jr. 1.1 comprises a pair of round black anodized aluminum pieces, one each for placement on the shelf and under the equipment, with circular depressions centered in each, and a chromium steel ball to sit in the semicircle. The Jr. 1.1 also comes with a threaded hole tapped dead-center topside, so it can be attached to any components that use 1/4-20 screws or be connected to another Jr. 1.1 if additional height is needed. The Jr. 1.1s are etched around the cup depression with the company's and product's names. The Jr. 1.1s slide in at $169 per set of three. Both sets of Rollerblocks come with comprehensive information and setup sheets that put some electronics owner's manuals to shame. Impressive. The Rollerblock Series 2+ footers were more effective at their job than the Jr. 1.1s, though not by a huge margin. The Series 2+ offers more freedom of movement as well as better vibration drainage. How do I know this? I listened. I compared both Rollerblocks, together and separately, to the various-sized Golden Sounds DH cones and squares I use under my Marantz 8260 SACD player and Audio Research SP16 preamp. I tried each set under both components, and I ended up preferring the Series 2+ under the preamp -- tubes, you know -- and the Jr.1.1 under the digital player. It was a bit disconcerting at first to feel my equipment move so easily at even the slightest touch. But, because each component quickly settles back to a neutral position, it soon became a non-issue. And because this is exactly one of the benefits Symposium designed the Rollerblocks to have, I was pleased to see reality equal promise. 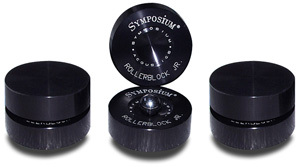 Symposium makes a number of sonic claims for the Rollerblocks, including lowering distortion; adding more air, detail, and harmonic richness; increasing the size of the soundstage; tightening bass; and enhancing midrange presence. I cant say that I achieved all of the claimed benefits, but the biggest improvement I noticed was a lessening of artificial warmth, in the form of an increase in fullness and detail. Robert Earl Keens SACD reissue of A Bigger Piece of the Sky [Koch Records KOC-SC-9807] was illuminating in this regard. With the DH cones in place under the preamp, Keens vocals were clear, but a bit thicker-sounding than reality would dictate. They were also set back into the soundstage, more on par with the instruments of the band. Replacing the DH cones with the Rollerblock Series 2+ footers tightened up the vocals noticeably and brought them forward, out in front of the soundstage, which was now more spatially defined. They also brought better tonal balance to the guitars, greater clarity to the cymbals, and, a clearer, more defined -- though not any deeper -- bass. Though the Rollerblock Jr. 1.1 footers accomplished somewhat similar results, these improvements were subtly but clearly more noticeable via the Series 2+ Rollerblocks. I also noted that either set of Rollerblocks, but especially the Series 2+, helped to increase the clarity of the entire musical presentation. William Topleys latest CD, Sea Fever [Warner Brothers 49382-2], was a case in point. The title cut contains some tasty acoustic- and electric-guitar work by former Dire Straits headman Mark Knopfler. With either Rollerblocks under my equipment, both instruments sounded more real. The acoustic guitar in particular displayed an organic wholeness that made suspending disbelief easier to accomplish. Again, by way of contrast, the DH cones overlaid the presentation with a slightly artificial sense of warmth that robbed the sound of its pristine pureness. A cleaner, clearer top end was another benefit of using the Rollerblocks under my equipment. Playing Mike Oldfields update of his classic, Tubular Bells 2003 [Warner Strategic Marketing R9 60204], I heard more precise and extended treble, as the reproduction of the tubular bells demonstrated. From the initial crack of the transient all the way through the last vestiges of harmonic information wafting into the soundstage, the sound was truly lovely -- not colored lovely in any way I could recognize, but true-to-life lovely. And the combination of Svelte Shelves and Ultra Platform together with the Rollerblocks peeled another layer or two of scrim off the music, increasing focus even more. 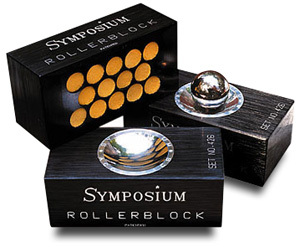 Are Symposium Rollerblocks worth the cost? I certainly think they are. In comparison to their competition, they come in reasonably priced, they are very well made, and they include superb annotation. While the Series 2+ Rollerblocks did a better job of isolating and floating my gear, the Jr. 1.1s will get you about 85% of the way there for about half the cost. Both lived up to Symposiums claim that mechanical coupling, combined with freedom of movement, offers an effective way to drain gear of and isolate it from unwanted vibration. I was more than a little pleased with the changes -- nay, improvements -- Rollerblocks wrought in my system. Try Symposiums answer to the problem of vibration. I doubt you'll return 'em. Prices: Rollerblock Series 2+, $399 USD per set of three; Rollerblock Jr. Version 1.1, $169 per set of three.